My daughter gets a package from her godmother every June near the anniversary of her baptism. When she was little, it was usually a book. As she grew older the books kept coming, but occasionally there would be other things instead. This year two presents arrived—a cross and spirit necklaces from Iona and Taizé, precious gifts indeed. Every gift was a reminder of my daughter’s baptism, that she is loved by God and her godmother. This year’s present came with a bonus—lunch. My daughter’s godmother was in town a couple of months after the baptismal anniversary and took her to lunch. That might not sound like much, but my daughter is 13. It’s a hard age, one at which kids need all the love and support they can get. The time her godmother invested in that lunch was love in action—after it my daughter was reassured she is loved by her godmother, and God, no matter what. Neither lunch, nor the crosses, nor any of the other presents were required. Little is expected of godparents. Typically all they do is show up at the baptism, say yes to a couple of promises they hadn’t even considered and then do nothing. It’s what most of us godparents have done, including, unfortunately, myself. But I’ve learned that a godparent can be so much more. My daughter’s relationship has shown me the impact a faithful godparent can have on a child. Godparents can make a world of difference in a child’s life simply by being present, whether it’s through lunch, gifts or in some other way. It’s a unique role, one that I will fulfill better in the future and will never take for granted again. Who is your godparent, and how would you like to spend more time with them? 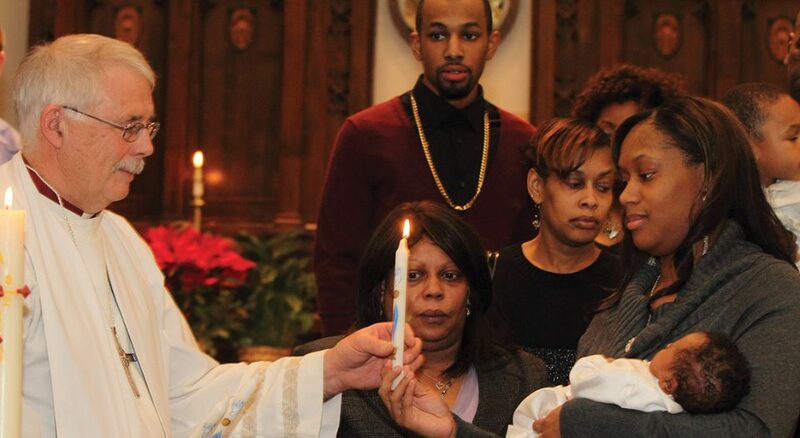 What questions do you have for your godparent about baptism and God? For future parents: Be thoughtful about this decision. Ask someone who will take the “God” part of “godparent” seriously. For current parents or grandparents: Talk with children about baptism. Ask them questions. Have them ask you questions. Remember their baptism by marking their forehead with the cross of Christ, and tell them God loves them and you do too. For godparents: Claim your role. Remind your godchild of the anniversary of their baptism every year. Send a small gift to remind them of your love and faithfulness. Spend quality time with them, and just them, when you can. They know you don’t have to, but you choose to, just as God did. Simply by being part of their lives, they will experience God’s love and faithfulness through you. Scott Seeke is pastor of Holy Cross Lutheran Church, Livonia, Mich. He is also a writer best known for the film Get Low and the follow-up book Uncle Bush’s Live Funeral, now available on www.amazon.com. You can find him on Twitter, Facebook and at scottseeke.com.